This "Historically Speaking" column appeared in the Exeter News-Letter on Friday, March 2, 2012. The Girl Scouts of the USA are celebrating their 100th anniversary on March 12, 2012. The organization was founded by Juliette Gordon Low, who had encountered the world wide Girl Guide movement while in England. Her first troop consisted of 18 girls, mostly family friends, who met in her hometown of Savannah, Georgia. In the early years of scouting, troops were formed independently of one another from town to town. Mary Ellen Hettinger, communications manager of the Girl Scouts of Green and White Mountains, said recently that “often the troops formed from other groups – a lot of times drum and bugle corps.” The first Girl Scout troop in New Hampshire was formed in Portsmouth in 1916. Because they were all independent, the state might have any number of ‘Troop 1’, ‘Troop 2’ and ‘Troop 3’. It was all very confusing, but there weren’t all that many troops in the early days. In Exeter, there were quite a number of other activities and groups for girls to join. Camp Fire Girls were very active (it was a former Camp Fire Girl, Jessie Griffin, who famously named the Ioka Theater in 1915 – believing the name meant “Indian Playground”). There was also a Fire Side Club for girls, a group called ‘Girls Work’ and the Jenny Wren Club. As wonderful as all these groups were, an awful lot of girls saw their brothers joining the Boy Scouts and yearned for something similar. The Boy Scouts were affiliated with the local Y.M.C.A. in their early years. They combined outdoor skills with patriotism. Girl Scouting began exploding after World War II. 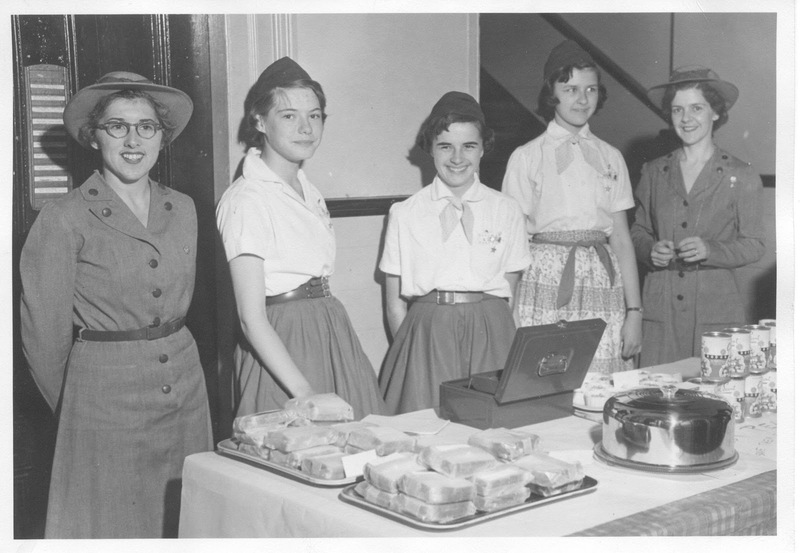 By the 1950’s Exeter’s Girl Scout troops were drawing over 300 girls into the organization. Viewed by the public as a wholesome group that would somehow defend the world against the Cold War (really, at the 1951 Girl Scout National Convention, Dr Edward Lindeman spoke about how Girl Scouts can be an active force for freedom. How they might achieve this by hiking, selling cookies and making s’mores is anyone’s guess). The Girl Scouts in Exeter had widespread community support. The annual Antiques Show held at the Exeter Town Hall in the 1950s was sponsored by the Girl Scouts had 149 business sponsors. Cookie sales began in the 1920s, when a standard recipe for a simple shortbread cookie (similar to the “Trefoil” cookies on sale currently) was circulated to all the troops. The girls baked their own cookies for many years. Today, the annual cookie sale provides funds for local Girl Scout councils, summer camps and individual troops. In our local council – the Girl Scouts of Green and White Mountains – individual girls earn ‘cookie dough’ credit to help pay for summer camp programs, equipment and uniforms. As the Girl Scouts grew, there was a need for better organization and standardized training for the leaders. In New Hampshire, it took until 1958 for the scouts to organize themselves into what became the Swift Water Girl Scout Council. Another restructuring occurred in 2009, when New Hampshire and Vermont merged to become the Girl Scouts of Green and White Mountains. Locally, the scouts you encounter are part of the Tides to Timber Community, which is comprised of girls from Brentwood, East Kingston, Epping, Exeter, Newfields, Newmarket and Stratham. Most girls still choose to participate in troop scouting, but there are a variety of other options. Girls can join as independent members, or only for summer camp. There are also special interest groups such as the Coastal Rompers, who focus on the coastal environment, and an Anime group, which fosters and interest in Japanese animation. Girl Scouts are encouraged to try new things, provide service where they see a need and work together to solve problems. They are apolitical and remain neutral on many of the divisive issues that challenge society today, trusting instead that girls and their families can make their own decisions. Juliette Gordon Low’s vision was that the group would be ‘girl-centered’ and the mission to this day remains the same. Girl Scouting builds girls of courage, confidence and character who make the world a better place.